The DSA pack, how is the test performed? Why is a standardized approach towards dysphagia necessary? 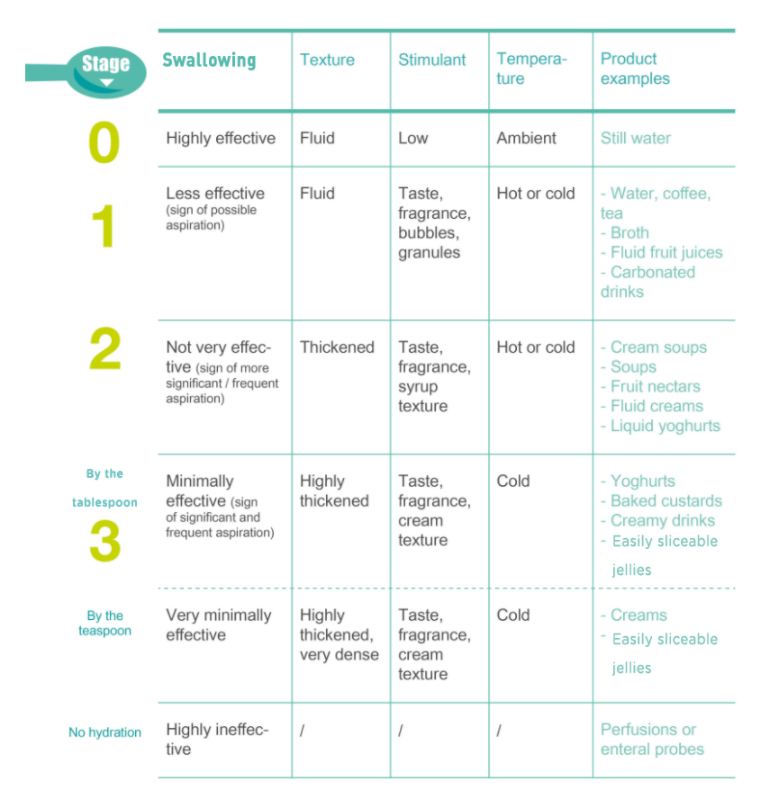 A standardized approach, standards and characteristics relating to texture, are required in order to recommend hydration or nutrition products. That is why Nutrisens Medical has developed a Dysphagia Standardized Assessment (DSA® ) via the DSA pack®. This pack includes the TCFD test proposed by Michel Guatterie, designed to detect aspiration as it happens, depending on the volume and the grade of the liquid at the time it is taken. The test result gives the grade required for drinks that is suitable for the swallowing ability of the patient so that they can drink and hydrate themselves safely. This simple test makes it possible to make a useful recommendation: either to resume swallowing liquids (from tap water at grade 0 to the very thick type 3) or to stop oral consumption. How to perform the test ? This is a safe method as the amount given to swallow is progressive. The amount that could go down the wrong way in the larynx is small and therefore harmless. This test can be performed by all caregivers (nursing assistants, nurses, speech therapists, masseur-physiotherapists, occupational therapists, dieticians, carers, etc.) as long as they follow the procedure, and in all locations (hospitals, care facilities or at home, etc.). The test sheet can be placed in the patient’s care record. This is the reference document for liquid grade recommendations. It can be reproduced and repeated as often as the patient’s progress dictates. The D.S.A. uses 4 types of liquids ranging from tap water to thickened. The different levels of viscosity associated with sensory and sensitive stimulations are called &apos;GRADES&apos; in this test. Each grade of liquid uses both sensitive stimulation of the mouth and the throat (temperature, flavouring) and a reduction in the speed of the liquid (viscosity, yield point).